Tolkien was big on family trees, we know the names of the kings of Numenor all the way down through Gondor and Arnor up to Aragorn. But what was the longest tree we have of elves? I'm trying to find out the maximum number of generations we know from the original awakening. We have the House of Finwë, which is comprised of 6 generations of Elves after him. Other than the House of Finwë (Noldor Elves), there doesn't seem to be enough information on the other Elven family trees, most notably the "pure" Vanyar and Teleri. The 2nd longest Elven family tree would be: the House of Thingol. It comprises of 5 generations of Elves after Thingol (a Sindarin Elf). As a side note, both Finwë and Thingol were the "Elven-ambassadors" responsible for leading their people in(to) Valinor. None of the Elves who first awoke were ever named, save Imin, Tata and Enel, and presumably Cirdan. However, we don't even know if Imin, Tata, and Enel exist!1 Cirdan is noted to be the longest-lived Elf by the time of the Third Age, but he doesn't have any descendants. 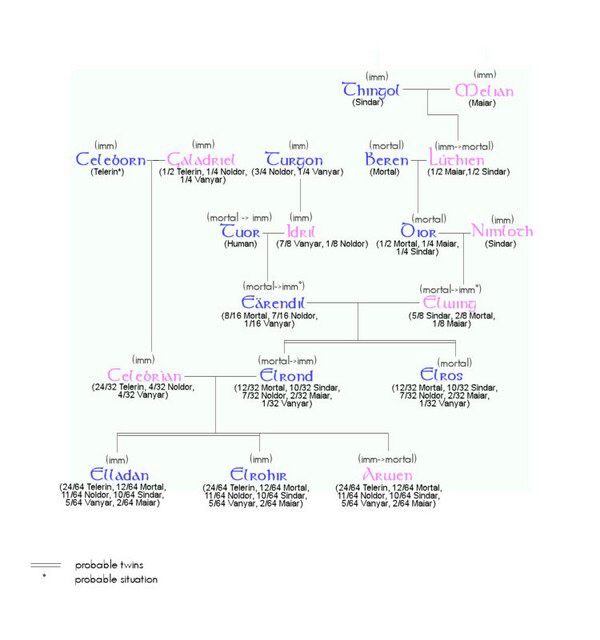 So it would seem that Finwë and Thingol have the oldest named family trees. 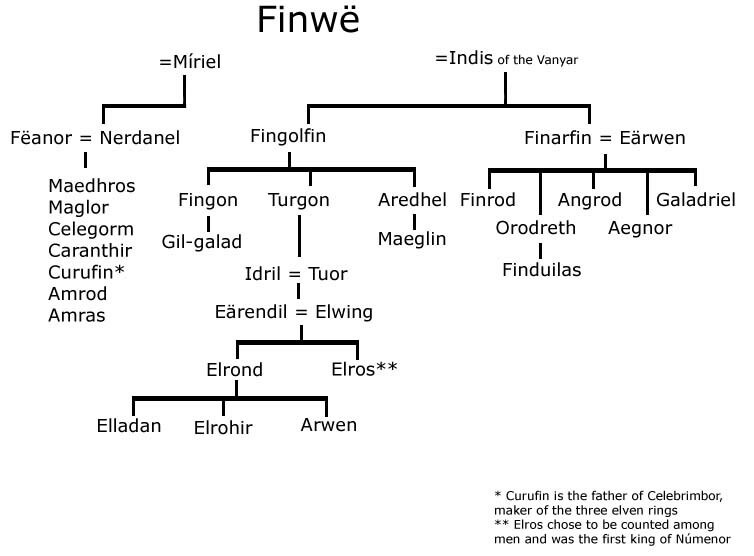 The house of Finwe comprises 6 generations from Finwe down to Elrond and Elros, and a further 2 if we add in Arwen and Eldarion (by which time it's no longer an Elven family tree). I am intentionally omitting Elladan and Elrohir since Tolkien left their final fates ambiguous. However Finwe was not one of the first awakened Elves. We know this for a fact because his first wife, Miriel, had a mother-name, therefore she cannot have been one of the first awakened, yet the first all awoke beside their spouses. So what this means is that there is at least one generation, possibly more, before Finwe. Of the 3 Elven kings who went to Valinor as ambassadors the only one who might have been one of the first was Ingwe, but we have no family tree for the Vanyar.